As an IT service provider, you strive to deliver great service to your clients. And in 2019, your clients have come to expect nothing short of an excellent experience with your company. But, what steps can you take to demonstrate your commitment to your clients and prospects? And how can you leverage the quality of the service you provide to improve reputation and accelerate growth of your MSP or VAR organization? While there’s no single answer to these questions, there are resources that your company can employ to harness client satisfaction for growth. One powerful resource is a single metric known as the Net Promoter® score, or “NPS®” for short. The concept was created by Fred Reichheld at Bain & Company and Satmetrix, and was later introduced as the Net Promoter® Score methodology in 2003 when Fred published an article in the Harvard Business Review – ‘The One Number You Need to Grow’. Even if you’re not familiar with the concept of NPS, you’ve likely participated in an NPS survey. Promoters (9-10): Your most loyal, enthusiastic fans. These clients are highly satisfied with your services and are loyal to your company. Promoters represent your strongest allies and are most likely to promote your service to their networks. Passives (7-8): These clients are happy (for now) but demonstrate an indifference to their experience with your company, and may be tempted by competitors. While not as immediately concerning as detractors, these clients represent a risk to retention and service reputation. Put frankly, they cannot be expected to be loyal to your company or promote your services to their own networks. Detractors (0-6): Your most at-risk group of clients. Not only are you at risk of losing the business of detractors, they are also the most likely to share negative feedback to their networks regarding their experience with you. Your service’s NPS “score” is calculated by subtracting the percentage of detractors from the percentage of promoters. By way of example, ClearlyRated’s lifetime NPS score is 84%, which is derived from the 86% of promoters across our company survey history minus the 2% of detractors across our company survey history. 86% – 2% = 84% NPS. Easy peasy. 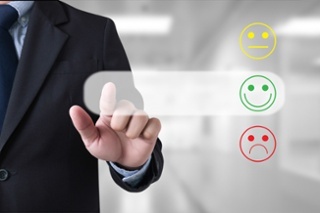 What is a ‘good’ NPS score for IT service providers? When it comes to NPS, you have a few options for determining what constitutes a “good” score for your service. Compare your organization’s NPS against competitors’ scores. In 2019, IT service providers averaged an NPS score of 24%. Look to service leaders across industries. 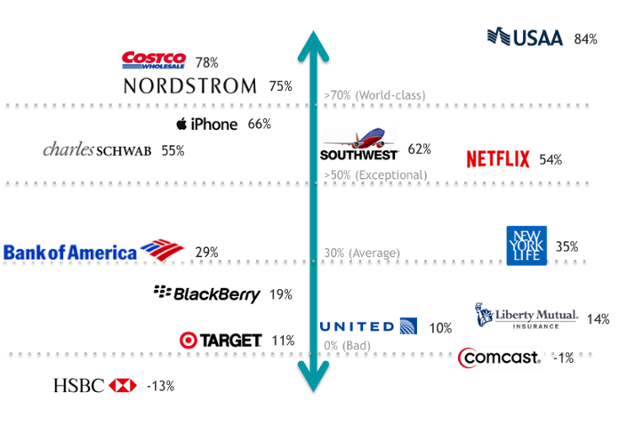 The chart below shows published NPS scores for brands across industries. You can begin to see how clients of recognizable service leaders like Nordstrom rate their company (75% NPS) versus, say, Comcast – a notorious service laggard – who received a score of -1%. It’s simple. Because it’s a single metric, NPS is easy to measure, track over time, and use to benchmark your company’s client satisfaction and service quality against the rest of the industry. NPS is a data-driven approach relying on insights directly from the client. The concise format of the survey allows you to focus in on the information that really matters while taking the guess-work out of assessing how your clients feel about you. Time is everything (it’s short!). People tend to turn and run when they see long surveys. And as much as your clients are ready and willing to provide you with feedback – they are protective of their time. It promotes transparency. By quantifying intangible concepts like client satisfaction and service quality, NPS provides technology service providers with a singular metric to weigh performance, set improvement goals, and to rally the team around. When everyone in the organization has a clear understanding of how their behavior can inform NPS, they’ll begin to obsess over client satisfaction and service quality as a practice and a philosophy. Interested in additional data? View current NPS benchmarks for IT service providers.